Today’s topic on the “I.P.T. Certified-M.D. Awareness Week” speaks about respect to a great man that left us a legacy that today has helped and improved the lives of many patients all over the world. The family legacy of 3 generations of devoted doctors, that have struggled and fought very hard to bring forth this medical treatment called Insulin Potentiation Therapy. Each of these 3 generations has had to make great sacrifice and hard work to make this option available to people from around the world. I.P.T. didn’t spread by it self, it’s been decades of devotion and care from these doctors and colleagues, and that must be valued and respected. It has been said that the 4th generation will be the I.P.T. doctors around the globe; this treatment must be shared with other doctors, for the benefit of the patient. But this contribution should be done with respect and honor to the founder and descendant of Donato Pérez García, MD (1896-1971). Sharing the knowledge of I.P.T. doesn’t mean that any doctor or group of doctors can just take it for themselves and exclude the head director and senior instructor of I.P.T. It must be a willing collaboration among colleagues, to share and exchange information that will make them grow as professionals, keeping in mind the priority of their everyday work: the well being of the patient. Not every medical doctor can be an I.P.T. Physician. It takes time, effort, preparation and a thorough evaluation to certify a doctor as an official I.P.T. Physician, capable and competent to perform this protocol, always keeping the security of the patient at high priority. Not all doctors are willing to do this hard part and choose to “skip” an authorized certification by the rightful owner of Insulin Potentiation Therapy. Each year there are Global I.P.T.-I.P.T.L.D® Conferences where all medical doctors are invited to join, each year there are seminars and training I.P.T. workshops given by Dr. Donato Perez Garcia, MD., the option to be officially certified is there and its open, yet many choose to practice I.P.T. without ever being evaluated or supervised, putting the patient’s life and well being at great risk. 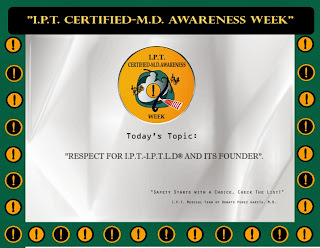 Taking off with the Intellectual Property of I.P.T. by associations, like Best Answer for Cancer, IOICP and other doctors that have no respect for the ethical values of this legacy, must be questioned for their true values as human beings. A doctor or association that’s willing to take off with intellectual property for their own benefit, excluding the founder of such an incredible treatment, is a doctor or Association worth questioning about. For we, as human being always have the choice to do well in a right/correct way, not at the expense of someone else’s hard work. This is why our “I.P.T. Certified-M.D. Awareness Week” is so important. Patients and the general public must be aware of this situation and make their own choice. A side from the issue of “safety” which is the most important, but also, on the issue of moral standards and respect for what’s authentic, the honor to these 3 men who’ve given us a medical protocol that can cure cancer, that can improve the quality of life of ill people, that can extend life and give hope in the most difficult battle of all, the fight to live and continue living, existing, doing the things we love, sharing happiness with people we love. That’s the real gift these doctors have left us and we should be grateful and respect their effort and hard work. Not only for us, but also for all the future generations to come. Thank you for taking the time to read this important information. Please be aware, be safe and Check “THE LIST” of certified I.P.T. Physicians endorsed by Donato Pérez García, M.D. IPT Medical Team of Donato Perez Garcia, M.D.